It’s the birth date of Charles J. Finger (1869–1941), Tales from Silver Lands, and Johnny Gruelle (1880–1938) Raggedy Ann and Raggedy Andy stories. Also born on this day was Clara Barton (1821–1912), founder of the American Red Cross. Christians all over the world celebrate today as the birthday of Jesus Christ. Read The Miracles of Jesus by Tomie dePaola and Jesus by Demi. In 1223, St. Francis of Assisi assembled the first nativity crèche. Read The Nativity by Julie Vivas and Saint Francis and the Wolf by Richard Egielski. 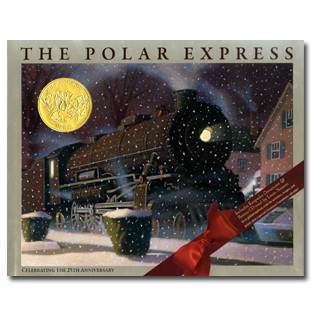 In 1985 a book appeared by Caldecott-winning artist Chris Van Allsburg that would immediately become a bestseller and over the years establish itself as a picture book ritually read and enjoyed by families during the Christmas season: The Polar Express. Chris came to his career as a children’s book writer through his work as a sculptor. He fashioned intriguing pieces like “Sinking of the Titanic,” and then drew black-and-white works in graphite and charcoal, which he exhibited in New York along with his sculpture. Every great creator needs a guardian angel to help him along, and in Chris’s case that angel happened to be his wife, Lisa. She believed that her husband’s drawings might be turned into a children’s book and took his portfolio to editors in New York and Boston. One of the most vivid memories of my career is of the day Lisa arrived in the Houghton Mifflin offices at 2 Park Street in Boston. Walter Lorraine, head of the children’s book department and subsequently Chris’s editor, asked Lisa to place these drawings along a wall so that everyone there could see them. I thought then what I think now—I was looking at the work of someone who could and would change picture books in America. Chris incorporated so much storytelling content in a single piece that any viewer could write a short story about each one of these pictures. Many of those drawings, by the way, were later published in The Mysteries of Harris Burdick. That day Walter Lorraine gave Lisa the promise of a contract for any book her husband wanted to create. And the rest, as they say, is history. His first book, The Garden of Abdul Gasazi, established Chris as one of the best new artists of the 1970s. His second book, Jumanji, won the Caldecott Award. His sixth book, The Polar Express, began as an image of a train standing in front of a young boy’s house in the middle of the night. Where was it going? Van Allsburg thought it might be headed north, and then he decided that the train, The Polar Express, would transport children to the North Pole on Christmas Eve. In pastel drawings on brown paper, Van Allsburg sketched out the journey of that magical train. At the North Pole, Santa and his elves greet the passengers—and he gives the young boy, who narrates the story, a bell that rings for all those who truly believe in Christmas. The book ends with a picture of the bell, one the narrator still hears ringing throughout his life. Dedicated to Van Allsburg’s sister, Karen, the book showcases a wonderful brother sister relationship. As is true of so many classics, the story moved from the personal landscape of its author into the minds and hearts of its millions of readers. It can be read as a magical adventure—or even as a statement about the nature of faith or belief. Happy 27th anniversary Polar Express; may your bell keep ringing for all who truly believe. Originally posted December 25, 2010. Updated for . When I first saw, and read this book, I was overwhelmed by the emotions it touched in me. The power the images convey of believing in your own creative spirit, and of the simplicity and kindness needed during the holidays, and all days, was nothing short of a powerful reminder of the perfection that is the child, and just how fragile that little being is. The envoy delivers the word that you must be on watch, or you may well lose the glorious creativity you come with in childhood. A message that is nothing nothing short of masterful, and healing. I believe in a way that children are messengers, and we fail to listen at our own peril. In some ways, this also reminds me of something I read in Hitchhiker’s Guide to the Galaxy. In that work of fiction, It was said that trees on earth were really not trees. They were here as centurions and messengers to a creator watchman. This often makes me think of children sending silent messages to the adult. Their own adult being , and to others. Thank you for your thoughtful comments about Polar Express — and your support of the Children’s Book a Day Almanac. This is such a beautiful and personal review of The Polar Express – I don’t have words to express how important it is that you put it down on paper. Even for me – I just ordered The Polar Express for my kids earlier this month to add to our growing collection of Van Allsburg picture books. I never read it before, so I also bought it for the little kid inside me. You are lucky to have such a deep personal connection to the world of children’s books, but we are lucky that you decided to share it with all of us. Thanks once again for the Children’s Book-A-Day Almanac. I simply adore your site. Funnily enough, the first three Van Allsburg books that are standing in our home library are: The Garden of Abdul Gasazi, Jumanji and The Polar Express. The troika you mentioned above. The “Polar Express” was Christmas Eve reading throughout my children’s childhoods, and is already a part of my granddaughter’s library. Chris Van Allsburg books are favorites in my classroom too. I love your website, and am pleased by how many books you highlight that I know. My fifth grade class was intrigued to find “Blood on the River” featured last week, as I’m reading it aloud to them right now. Thank you! Debbie: Thanks for the note. I’m pleased to hear you are reading Blood on the River. I missed this book when it came out — but author Greg Maguire recommended it to me, because his kids love it so much. I was enthralled from the moment I picked it up. What I said last year about Polar Express, still goes. Oh gosh. I gotta go. I think I hear a train coming down the street in front of my house..
Gordon: Hope you have a wonderful train ride! 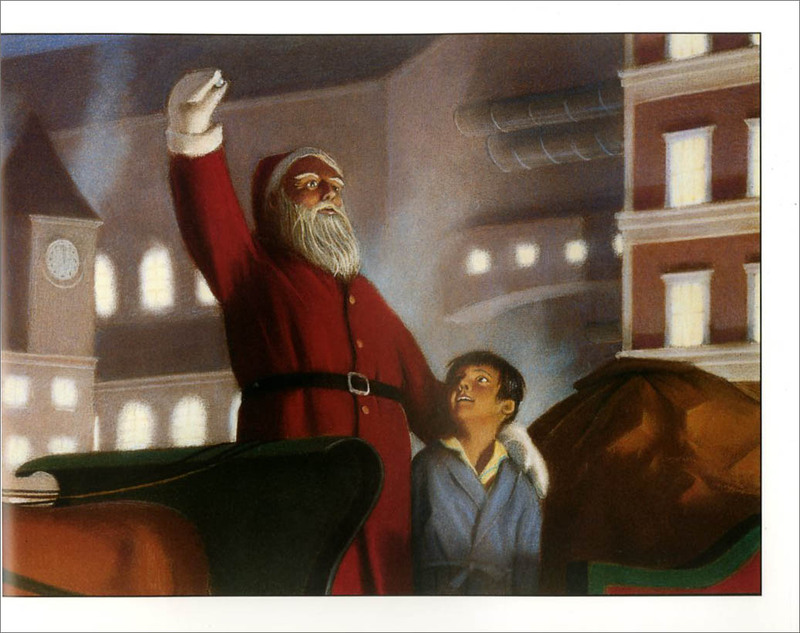 I am a great admirer of Chris Cringle, and Chris Van Allsburg both, and their gifts are justly famous and revered, but if you both would be so kind to stand aside for a moment please. Something needs saying this day. The Gift of the Magi is a favorite book of mine at this time of the year. In its way, it’s the kind of gift I am going to honor today. It may be one of the things that made me think to write this. There is the gift of art and words for children, which can, and in fact does, transform lives, young ones and grown ones. Without those stories, life is not what it was meant to be. I know that, for a fact. Someone once said, gaining as much wisdom as possible while on this planet, and to keep on learning to love, are two reasons for making life worthwhile. Indeed, that may be the wisest thing I’ve ever read. I struggle daily to abide by those things. But also, there is another gift. It is a gift, which ranks above that of art and words for children. It is the gift of getting the great treasures of childhood literature delivered to the minds of those children (and adults like me) and without that, all those stories in all those books, are unknown, they cannot enrich lives. Who has given me the most childhood? The true, first gift of Christmas. Who, single handedly constructed a treasure of truly great children’s books, laid the cornerstones, and then placed on a permanent foundation in my deep hearts core, a great new place in my being? Who is responsible for the gift I was given as an adult, of having several hundred amazing children’s stories placed in my heart, when there were almost none there before? The Polar Express is a great and wonderful work. That great and wonderful work, as I like to call her, is Lady Anita Silvey. Treasure keeper of mine own deep child’s book heart. Gordon: Thank you for this Christmas gift — it made me cry.